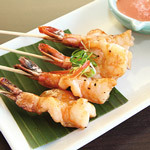 Char-grilled marinated prawn on skewers served with eastern Thai style sauce. 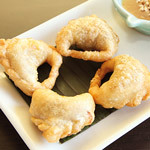 Curry powder marinated minced chicken, onion, and vegetables wrapped in puff pastry, served with sweet chili sauce and crushed peanuts. 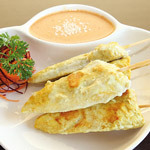 Traditional Thai style chicken skewers marinated in mild turmeric spices, served with peanut sauce. 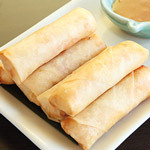 Deep fried chicken spring rolls served with sweet chili sauce. 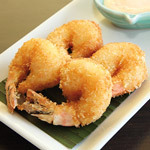 Golden crispy crumbed prawns in shredded coconut, served with sweet chili mayonnaise. 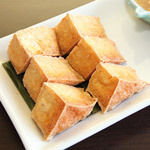 Deep fried tofu served with sweet chili sauce and crushed peanuts. 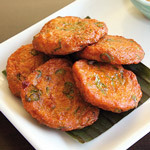 Marinated minced fish with chili paste, served with sweet chili peanut and cucumber salsa. 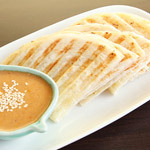 pan fried garlic roti bread, served with peanut sauce. 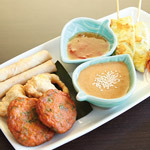 A combination of four entrées (2 pieces each); chicken spring rolls, vegetable curry puffs, fish cakes and chicken satay. 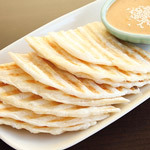 Pan fried roti bread, served with peanut sauce. 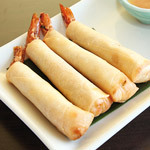 Tasty marinated prawns wrapped in spring roll pastry, served with sweet chili sauce. 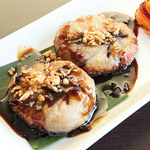 Pan fried Thai pancakes filled with Chinese chives served with sweet chili soy sauce. 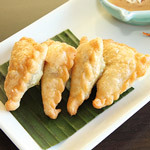 Curry powder marinated minced chicken, onion, carrot, peas and corn wrapped in puff pastry served with sweet chili sauce and crushed peanuts. 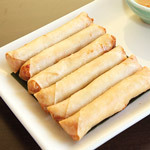 Deep fried vegetable spring rolls served with sweet chili sauce. 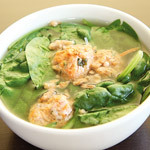 Clear soup with baby spinach. 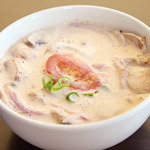 Creamy coconut milk and lemongrass soup. 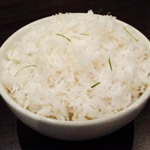 Traditional Thai style lemongrass soup. 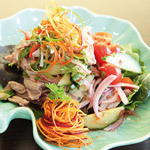 Yum Nuer - Grilled tender beef tossed through red onion, tomato, cucumber, Thai herbs, chili and lemon juice, served on a fresh salad. 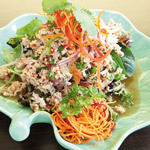 Larb Gai - Minced chicken with red onion, coriander, spring onion and mint seasoned with chili and lemon juice, served on a bed of lettuce. 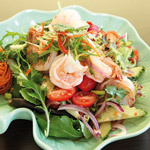 Yum Goong - Prawns tossed through red onions, tomato, cucumber, Thai herbs, chili and lemon juice, served on a bed of lettuce. 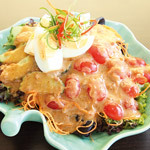 Lettuce, carrots, tomato, cucumber and sliced boiled egg topped with peanut sauce. 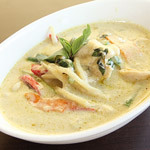 Traditional Thai spicy curry cooked with coconut milk and green paste with bamboo shoot, mixed vegetables and sweet basil. 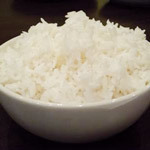 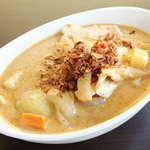 Tasty mild curry cooked in coconut milk with potato, carrot and onion. 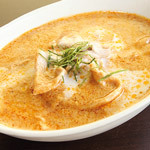 Spicy curry cooked in creamy coconut milk, red curry paste with a touch of lime leaf. 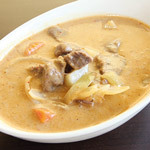 Classic Thai curry cooked with coconut milk and spicy red curry paste with bamboo shoot, mixed vegetables and sweet basil. 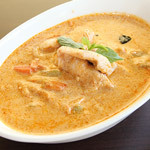 Medium to mild curry cooked in coconut milk, yellow curry paste with a hint of turmeric, potato, carrot and onion. 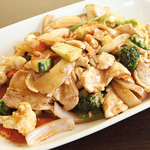 Pad Met - Stir fried cashew nut and mixed vegetables in oyster sauce with a touch of mild chili jam. 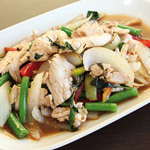 Pad Grapow - Stir fried chilli, sweet basil, garlic, onion and mixed vegetables in a spicy sauce. 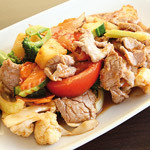 Stir fried garlic and pepper sauce. 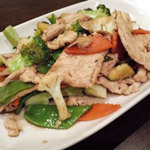 Stir fried ginger and mixed vegetables in oyster sauce. 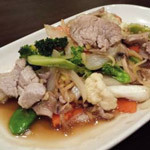 Stir fried mixed vegetables in oyster sauce. 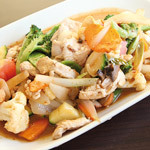 Stir fried mixed vegetables in peanut sauce. 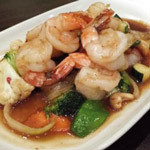 Stir fried mixed vegetables, tomato, cucumber and pineapple in Thai style sweet and sour sauce. 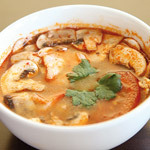 Stir fried mushroom, mixed vegetables and lemongrass with Tom Yum paste and a touch of coconut cream. 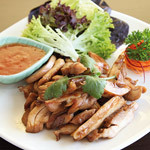 Thai style marinated char grilled chicken served with sweet chili sauce. 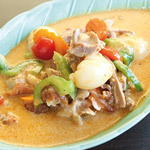 Roast duck cooked in coconut milk and red curry paste with lychee, mixed vegetables and sweet basil. 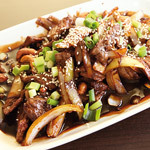 Stir fried beef, cashews and onion with Nakorn Siam's secret sauce garnished with sesame and spring onions. 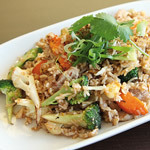 Fried rice with egg, onions, mixed vegetables, chilli and sweet basil. 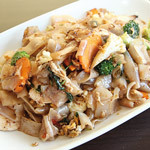 Pad Kee Mao - Stir fried flat rice noodles with egg, mixed vegetables and sweet basil in a spicy soy sauce base. 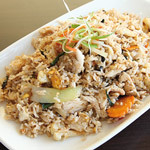 Thay style fried rice with egg, onions, tomato and mixed vegetables. 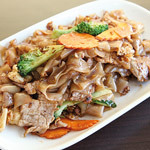 Stir fried flat rice noodles with egg, broccoli and bean shoots in a dark sweet soy sauce base. 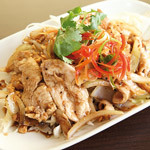 Stir fried thin rice noodles with egg, bean shoots, spring onions, tofu and crushed peanuts garnished with coriander and Chinese chives. 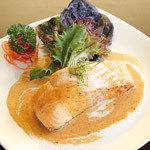 Pla Chu Chee - Pan fried salmon served with a spicy traditional red curry sauce. 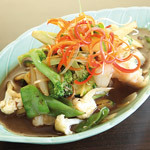 Steamed rockling fillets with Nakorn Siam ginger sauce.